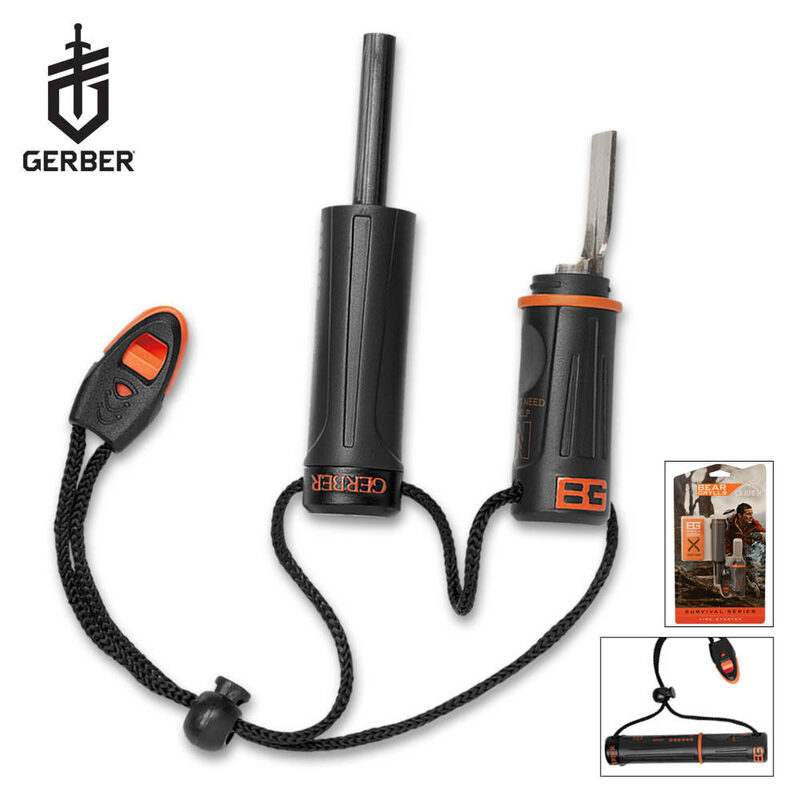 Small and compact, the Fire Starter offers years of use. Watertight construction keeps tinder safe and dry so you can trust it when you need it. Land to air rescue instructions and SOS. Device is light-weight and fits my hands comfortably. It is a little high in price but for a reliable, well constructed device that won't fall apart anytime soon it is well worth it. This GBG firestarter works really good, I recommend it, i like the material its made out of', feels pretty tough for extreme exposures, its easy to use last for many many sparks has a tiny little compartment after removing the cap at the end, can store painkiller pills or anything similar to its size and its all water sealed tight' I proved it my self. I like the whistle, it sounds more like a loud beep, comes with a little survivor tips notes pretty cool.. Overall, I am very happy with this purchase. A great tool for my camping bag. It's compact and is really easy to use I've started plenty of fires my only problem with it is that it's a little overpriced :( and that's why I'm only giving it 5 stars. GO BEAR GRYLLS!!!!!!!! The Bear Grylls Fire Starter is very neat. Its waterproof (to some extent), and its lasting. The whistle included on the lanyard is very loud and it could easily catch the attention of someone very far away. I particularly love how it can be put together into a capsule. Written on the capsule is a rescue signal code. My only complaints are, however, that it is a bit more difficult to get a spark from than strikers with serrated edges. It took me a few strikes to get my first spark, and you need to apply more pressure to get one. Another complaint is that the lanyard is too short to get a comfortable strike. Since both flint and striker are joined by the lanyard, you're hand is stopped after you try to spark it. This might not be too big of a deal, but it doesn't feel very natural, and it might give you a hard time trying to make a spark. I was dismayed that there was no proper instructions on how to use it. Although its fairly simple to use one of these, people not familiar to them would be confused at first, and get frustrated that there is no instructions. great item. even comes with tinder. though its a bit hard to strike the firesteel. it likes to carve instead of sparking. though thats a good thing if youre trying to light something that is resisting being lit as the shavings will ignight and make it hotter. Bigger than I though it would be. But also better. The lanyard however is only big enough to keep the pieces together. It's not something to wear. It comes with a manual for survival with quite a few tricks to help with everything BUT how to properly use this (though it should be common sense). The quality is worth the money however it would be nice to be knocked down a couple bucks.